Ethnic nationalism is acute in the former Soviet Union. 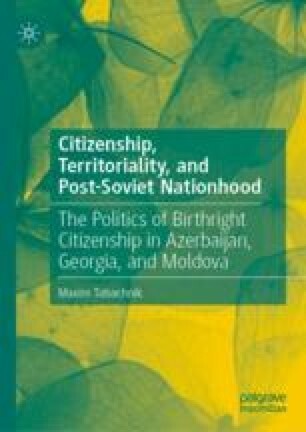 Yet Azerbaijan and Moldova have used an extremely territorial definition of the nation extending citizenship to anyone born on their territory, a legal principle found primarily in the Americas. No such law exists in Georgia, the third country, which forms a “buffer zone” between Russia and the West. The three countries cannot forge closer links to the West due to Russia’s support of the “frozen” separatist conflicts on their territories. The book links this development to territorial integrity concerns; a multi-century historical context that had thwarted or facilitated ethnic collective identity; and geopolitical fears of dual citizenship. The ancient tension between ethnic and territorial collective identities helps understand Russia’s foreign policy, which, if “frozen conflicts” reignite, can bring it to the brink of war with the West, just as it happened during the Ukrainian events of 2014. Attwood, Karen. 2015. Deeyah Khan Interview: The Award-Winning Filmmaker on Chronicling British Jihadism. Independent, June 13. http://www.independent.co.uk/arts-entertainment/films/features/deeyah-khan-interview-the-award-winning-filmmaker-on-chronicling-british-jihadism-10318164.html. Chait, Jonathan. 2016. Donald Trump Has Proven Liberals Right About the Tea Party. New York Magazine. http://nymag.com/daily/intelligencer/2016/12/donald-trump-has-proven-liberals-right-about-the-tea-party.html, accessed December 9, 2016. Zevelev, Igor. 2001. Russia and Its New Diasporas. Washington, DC: United States Institute of Peace Press. http://www.amazon.com/Russia-Its-Diasporas-Igor-Zevelev/dp/1929223080, accessed April 1, 2016.